Wenger Grapes is a small family farm growing Concord and Niagara grapes in the Shenandoah Valley. Visit our vineyards and share in the September harvest. Celebrating 80 years in 2018. 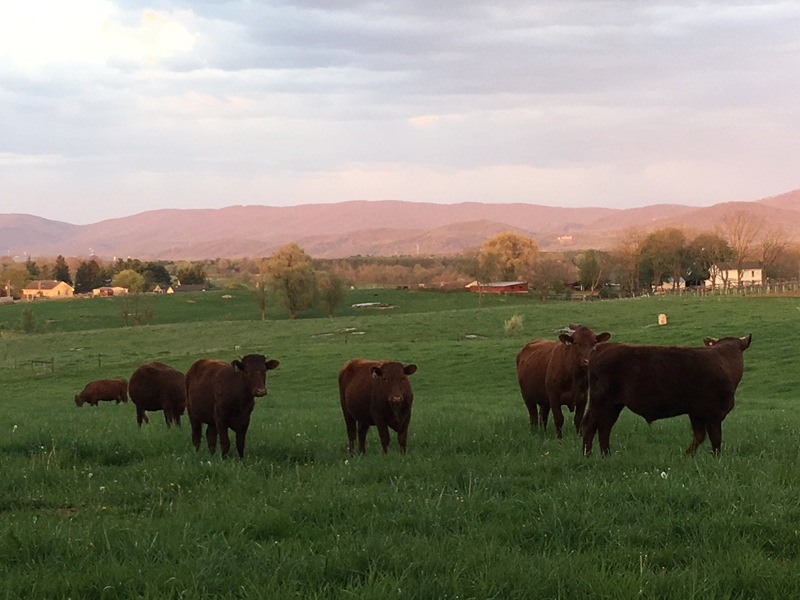 Grass-fed beef quarters for sale now! $4/pound, Devon herd, grain-free, no medications. Available mid-June. Call to reserve your share today! Our grape harvest runs from late August through the end of September. Come join in the bounty! Located just 2 miles south of I-64 at Waynesboro on Rt 340, a visit to our farm is easily combined with a trip to the Blue Ridge Mountains and Skyline Drive of Shenandoah National Park, historic cities of Staunton or Lexington, or an evening at the historic Wayne Theater in Waynesboro or Black Friar Theater in Staunton. 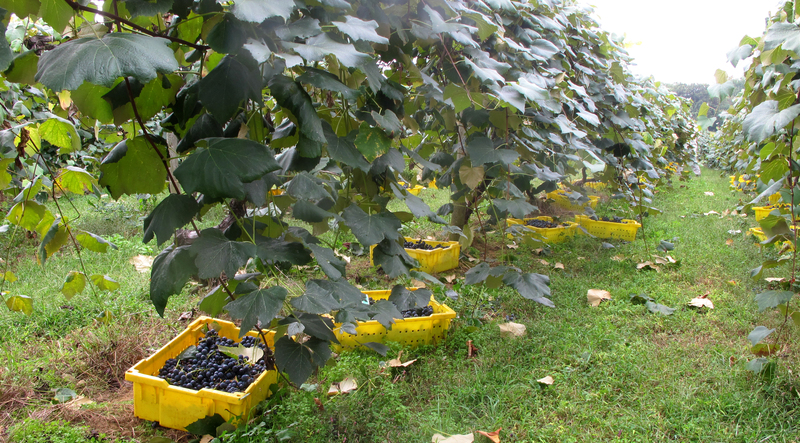 At the Farm – Pick Your Own and Fresh Picked: Concord and Niagara grapes are available in season at the farm. Our season typically begins around Labor Day in early September and lasts three to four weeks. 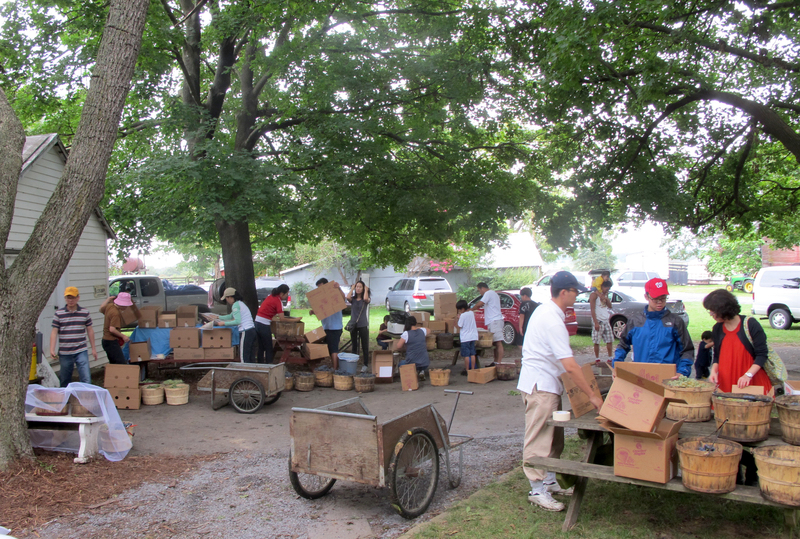 The farm stand at Wenger Grapes is open Monday-Saturday, 8 am until dark, in season. Closed Sundays. Current PRICES. For those interested in picking their own, we have carts for moving the grapes from the vineyard, picking containers to pick into, and picking shears available. We also keep on hand a supply of cardboard boxes for customers to transport the grapes they purchase. 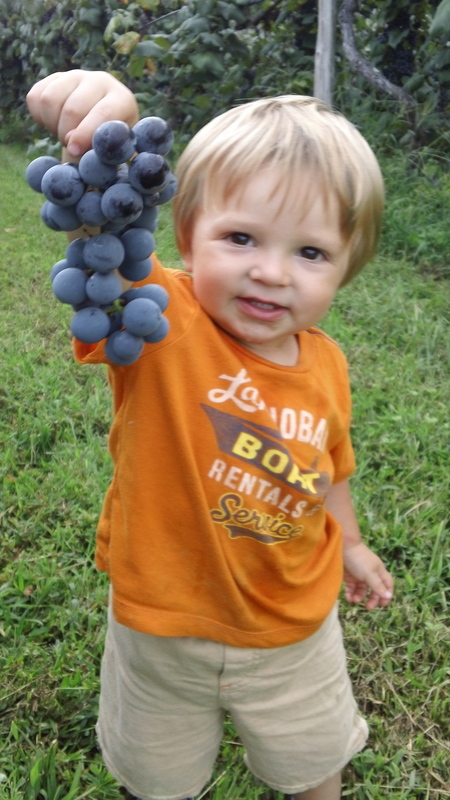 Picking grapes is great outdoor fun for the whole family! If you want fresh grapes already picked, please give us a call for orders over one bushel to ensure we have them ready for you when you arrive. 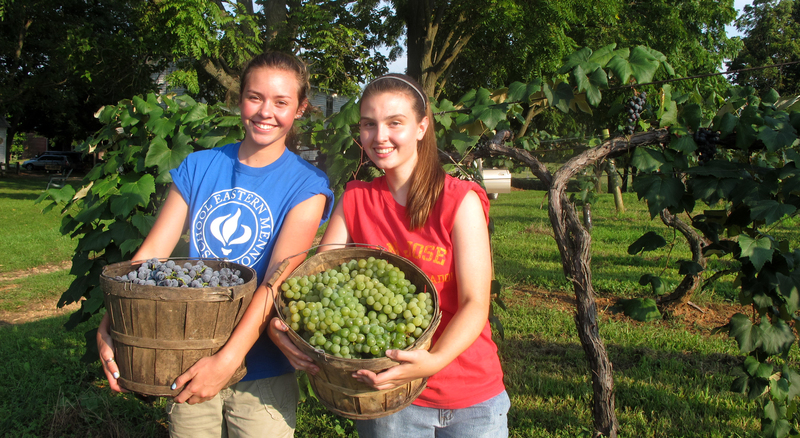 Farmers Markets: We sell grapes locally at the Charlottesville City Market on Saturday mornings in September, at the Stuarts Draft Farm Market, and at Agriberry farm stands around Richmond. Grocery Stores: Our grapes can often be found in season at local grocers Greenwood Gourmet Grocery and Crozet Market in Crozet, Rebecca’s Natural Food and Feast! in Charlottesville, Friendly City Food Co-op in Harrisonburg, and often at Food Lion, Whole Foods, Martins, Giant, and H-Marts in Virginia and surrounding areas. Wholesale orders – for eating: We sell direct to buyers as well as through produce distributors The Local Food Hub in Charlottesville, VA and Produce Source Partners in Ashland, VA. Contact us for more information. Wholesale orders – for wine and vinegar: We sell direct to wineries and buyers. Contact us for more information. 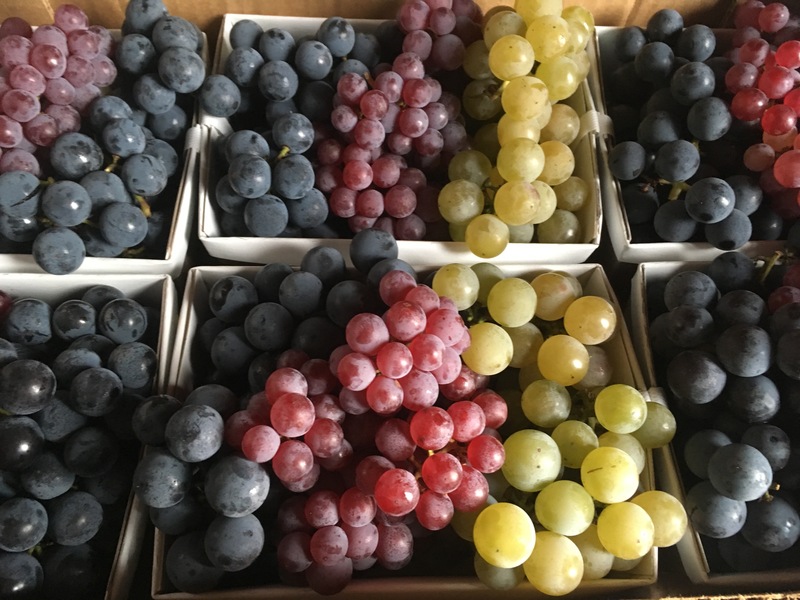 Pick-up Locations: Over the years, we have had a number of folks in various communities take half bushel orders of Concord and Niagara grapes in their area. Some folks do this only as a service to their family and friends while others are open to additional orders. We deliver freshly picked grapes to these locations on the specified delivery date. Concord grapes are American hybrids and well known for their sweet old-timey flavor and nutritious deep purple skins high in antioxidants. Versatile Concords and Niagaras are great for fresh eating, as well as juice, jam, and wine making. Concords and Niagaras are “slip skin” grapes, and offer a unique eating experience totally different from Europen-type grocery store grapes. One way to eat this type of grape is to hold a single berry with your fingers, squeeze the berry firmly into your mouth to get all the juice, and swallow the pulp whole, including the seeds, and then chew the skin for maximum nutritional content. 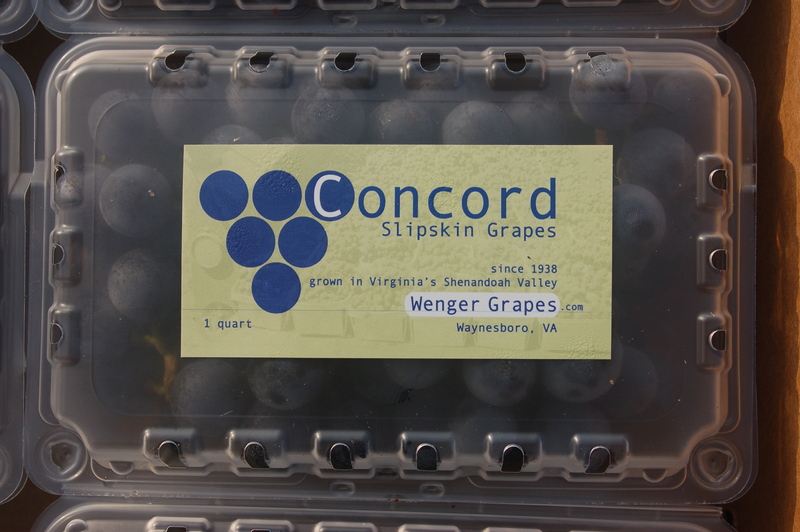 Concord grapes are grown on their own root stock, unlike many European varieties, and are therefore more well adapted to our mid-Atlantic climate and disease pressures. 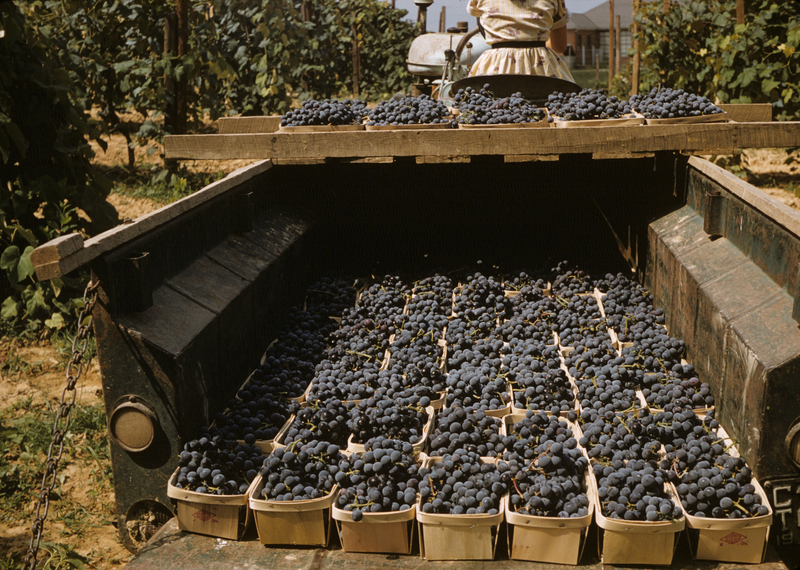 Hauling freshly picked grapes in the 1960’s. 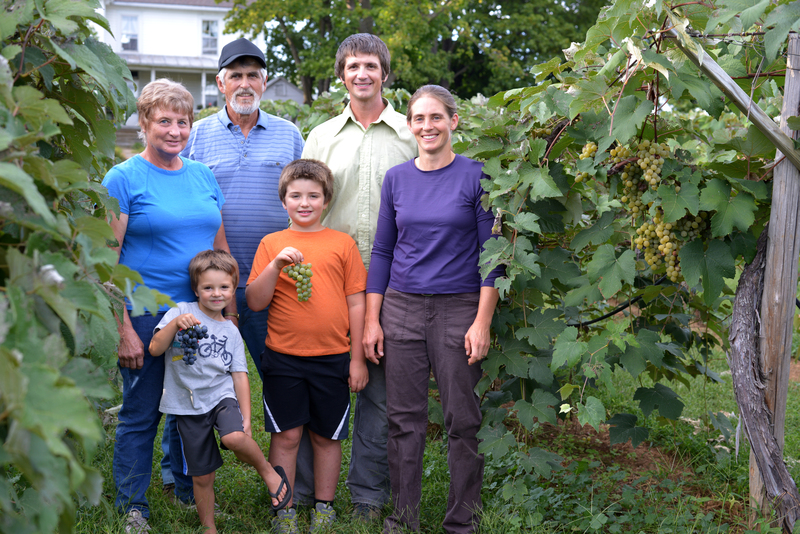 Wenger Grapes is owned and operated by two generations of the Wenger family, Dave and Mim Wenger and Mark and Wendy Wenger Hochstedler, featuring Concord and Niagara grapes and Devon grass-fed beef. 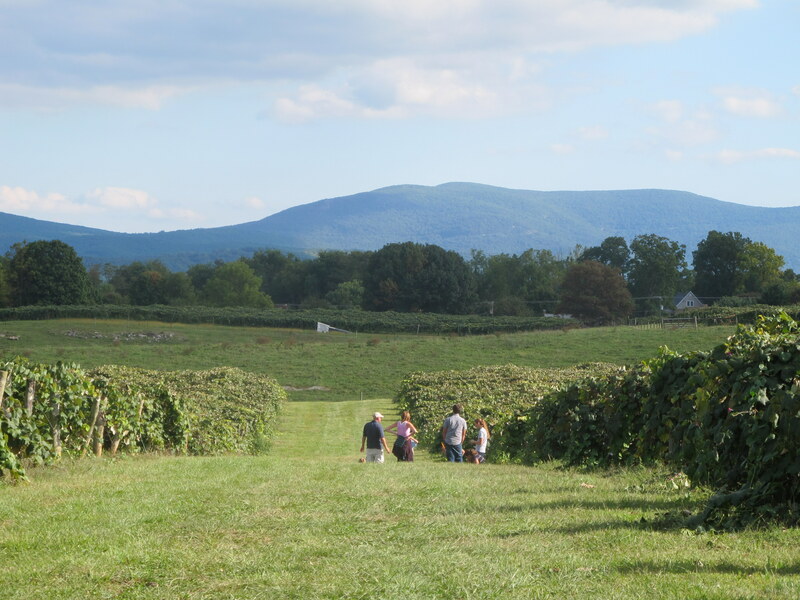 In 2018 we celebrate 80 years of our Wenger family raising Concord grapes in Augusta County in the beautiful Shenandoah Valley of Virginia. Grapes are a family tradition in the Wenger family. Dave’s grandfather, A.D. Wenger, had large grape plantings at Chesapeake (Fentress), VA and at Afton mountain on the Blue Ridge near Waynesboro in the early 1900’s. Several of A.D. Wenger’s children carried on the grape growing tradition including Chester Wenger in Lancaster County, PA, Amos Wenger in Chesapeake, VA and Paul Wenger in Augusta County, VA. Paul’s youngest son, David, took over the Augusta Co. farm in 1972. In 2018 the farm transitions to his daughter and son-in-law as the third generation to carry on the farm at this location. Already the fourth generation are regular contributors to the life of the farm, and our extended family and community are the helping hands and supporters on whom we depend. 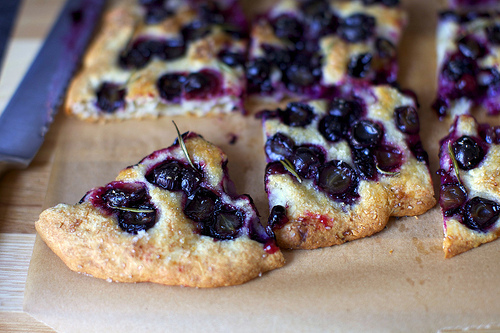 Grape Recipes — COMING SOON! We hope you will enjoy the recipes on this page as much as we do. We have listed a variety of grape jelly recipes, grape juice, and our favorite desserts made from Concord and Niagara grapes. If you have your own favorite recipe, we would love to hear from you! 1. WHERE CAN I BUY WENGER’S FRESH CONCORD AND NIAGARA GRAPES? 2. DO YOU OFFER QUANTITY DISCOUNTS? 3. DO YOU SPRAY YOUR GRAPES? 4. DO YOU OFFER GUIDED EDUCATIONAL TOURS? 5. WHEN ARE YOU OPEN? 6. HOW LONG DOES THE SEASON LAST? 7. HOW DO I CARE FOR MY PURCHASED GRAPES? 8. 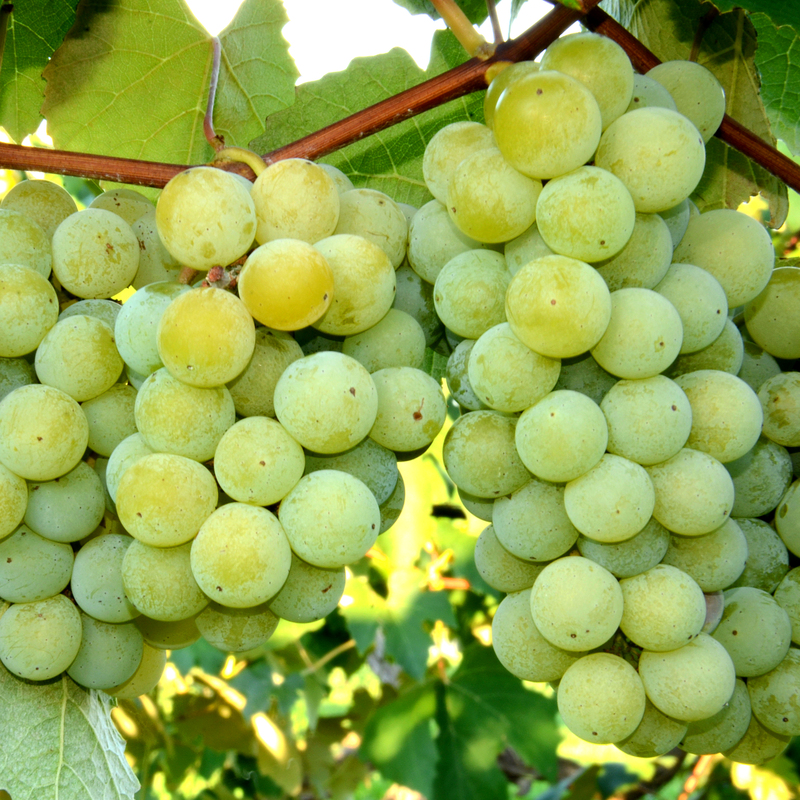 WHAT IS THE DIFFERENCE BETWEEN THE CONCORD AND THE NIAGARA VARIETIES OF GRAPES? 9. HOW DOES ONE EAT THIS TYPE OF GRAPE? 10. WILL GRAPES, LIKE SOME FRUITS, RIPEN FURTHER AFTER THEY ARE PICKED? From the north or east: Take exit 94 on I-64 at Waynesboro. Turn left/south onto Route 340/Stuarts Draft Highway. Go 2 miles, and our farm is located on the right. Look for the “Wenger Grapes” sign, a big red barn, and a small vineyard by the road. The farm stand is located beside the white farm house, behind the vineyard. From the south: Take exit 213 on I-81/I-64 for Rt 11 toward Rt 340/Greenville. Turn right onto Rt 11 for 0.2 mi. Turn left/north onto Rt 340 toward Waynesboro. Go 10.2 miles, passing through the town of Stuarts Draft, and the farm is on the left. Look for the “Wenger Grapes” sign, a big red barn, and a small vineyard by the road. The farm stand is located beside the white farm house, behind the vineyard. Header image by Allison Profetta.